When did the Medieval period end? Just as it didn’t "begin", it didn’t really end. History simply doesn’t stop and then restart as something else. History courses do begin and end, however, so historians invent and embrace "periods". 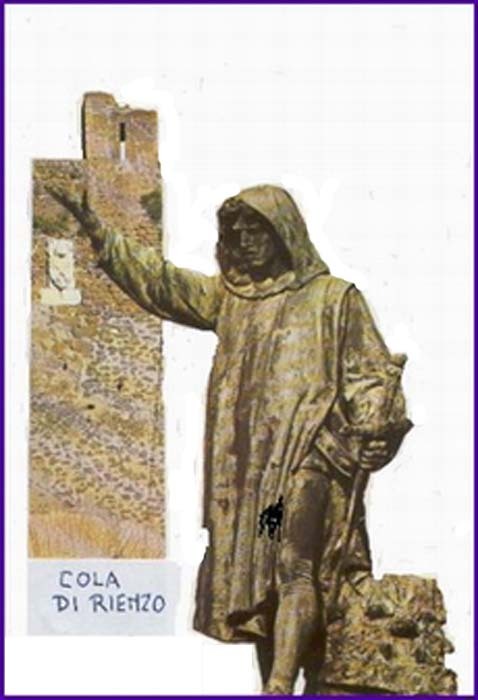 Most historians say that the European Medieval period ended with The Plague and its aftermath or that the Roman/Italian period ended with Cola di Rienzi and his aftermath. Much of what we know about Cola di Rienzi is semi-legendary. Petrarch, who transmitted and controlled some of the initial information was an interested party — some say that Petrarch may have manipulated Rienzi as part of the Guelph/Ghibelline conflict and/or as part of the Colonna / Orsini rivalry in Rome and/or as an agent for the Avignon Pope (a Frenchman) who really wanted to stay in Avignon. The Rienzi Story: Rienzi’s younger brother was killed in a dust-up between the Orsini and the Colonna. Rienzi, who had been a client of the Colonna, asked for and was promised revenge by the Count, but the count reneged when he discovered that Rienzi’s younger brother was killed by Colonna’s own lieutenant. Rienzi rallied the people to oppose/expel all of the nobility — i.e. both the Orsini and Colonna factions and their various allies. The nobility fled — perhaps because they had previously had to send most of their urban retainers to the countryside to fill in behind a starving peasant population. Rienzi antagonized the population and the church, and he fled when the nobles returned with their minions. After wandering and imprisonment, Rienzi was returned to Rome under the sponsorship of Petrarch and the Avignon Papacy. Rienzi soon antagonized the population again by taxes and his own excesses Including bathing in the St. John Lateran baptismal font. The nobility moved against him, and the antagonized "popolo" didn’t rally to his aid. Rienzi was murdered by the nobility on the steps of the Palazzo Senatorio — he was then hacked by other nobles and thrown to the dogs. A cynic might find a different story: After Rienzi was shocked by the death of his brother he was manipulated through the above chain of events by Petrarch and other Avignon Papal partizans(/agents?) who wanted to bring the nobility down a notch or two. After that was accomplished, the church withdrew its support and Rienzi was discarded. Petrarch, as poet laureate and papal house philosopher made a pretty speech. Post-Rienzi exploitation of the legend Later dictators (universally ignoring how Rienzi ended) made him an heroic icon. Napoleon, Hitler, and Mussolini all glorified Rienzi as their own heroic predecessor — they would finish his mission and restore the ancient Roman Empire. Napoleon had a copy of de Cerceau’s Rienzi book with him at Waterloo. Hitler told friends and the heirs of Wagner that Wagner’s opera, Rienzi, had been the motivational force of his life. (Wagner’s opera was based on Bulwer-Lytton’s novelization of the Rienzi story (full text). Mussolini had Gabriele d’Annunzio, the author of the most famous Italian glorification of Rienzi (Italian text), as his own philosopher/poet laureate — the relationship paralleled that of Rienzi with Petrarch. Population had grown dramatically in the 150 years before 1315, but then it started to drop. The evidence is clear that population had hit a peak in Italian towns well before the plague struck in 1347. Expansion of city walls stopped. In Rome, where there had already been large open spaces inside the Aurelian walls, the abitato had been growing, but then it shrunk again. According to Malthus, population grows geometrically while supplies grow arithmetically, but, in fact, that's not true in subsistence economies where supplies regulate population pretty quickly and very effectively -- folks simply starve to death as you move from subsistence to famine. A three-year famine started in 1315. Then there were a few good years, a few bad, etc., but soon there were more bad than good. Land had been overused -- couldn’t even raise an increase on initial seed weight. And the weather also changed. As we've seen, the "Medieval Warm Period" ended and the "Little Ice Age" started at the end of the first quarter of the 1300s. A population die-off caused by famine was already in progress even before the plague arrived, and those who didn't die were in a weakened state. Although "psychology" is always a dicey thing to bring into the study of history, it probably played a part here; not only were folks stressed by the increasing difficulty of putting food on the table, but, particularly in Rome, politics and the economy also were on a seriously chaotic course. Cola di Rienzi was busy agitating the lower class (the Roman mob redux), and the existing power structure -- the nobility -- was leaving town, both because of Rienzi and because the reduced rural population (those famines) required their presence on rural estates. Actually it was their retainers who were needed in the countryside, but if the retainers went to the fields, the nobles didn't have much of an urban gang to surround and protect them, so the nobles also left town. When plague entered Rome, the population was therefore neither physically nor mentally able to resist. Premonitions In 1345, Saturn, Jupiter, and Mars aligned in Aquarius and astronomer/astrologists made dire predictions. Early in 1348, a major earthquake rattled Italy from Naples to Venice: it was clearly volcanic as indicated by the release of vast clouds of sulfurous gasses — smelling of fire and brimstone -- in the Campi Flegrei. Within hours of feeling the quake, Romans and Neapolitans smelled the results, and when plague reached the cities a few weeks later, everyone "knew" that the "mal aria" was the real cause. Diseases that are endemic to areas produce general immunity unless they are so virulent that everyone dies. There are long-term low levels of infection and, most importantly, equilibrium is established. Diseases can and do change, sometimes by mutation ("evolution"). Diseases evolve toward weaker strains. The most virulent strains produce the greatest death rates in their hosts and therefore have less probability of long term survival: if, after a short time, there are few remaining hosts, then there is less probability of continued contagion. Diseases can have multiple hosts. In the case of "plague" caused by yersina pestis bacteria, there are three: rodents, fleas, and humans. Fleas die after being infected (their digestive systems get blocked), but before they do, they may infect humans. The mechanism appears to be that a common mutation in yersina pestis that makes it indigestible in the flea gut. The gut blocks and the flea stomach fills with rapidly proliferating yersina, but nothing gets to its intestine where digestion takes place. The flea gets (literally) insatiably hungry. When it tries to feed, the pressure from within its engorged stomach forces some yersina into the bite wound. Fleas would keep biting and trying to feed Intel they died of malnutrition. People die either from massive infections at the bite site(s) — large swellings called buboes marked the sites (bubonic plague). If the infection had time to reach the victims’ lungs before they died, the pneumonic version of the plague could further spread by aerosol expulsions (coughing, sneezing). Plague could also reach the blood stream (sometimes called septicemic plague) and blood would then also be infectious. If infected bodily fluids entered the food supply enteric plague could spread. 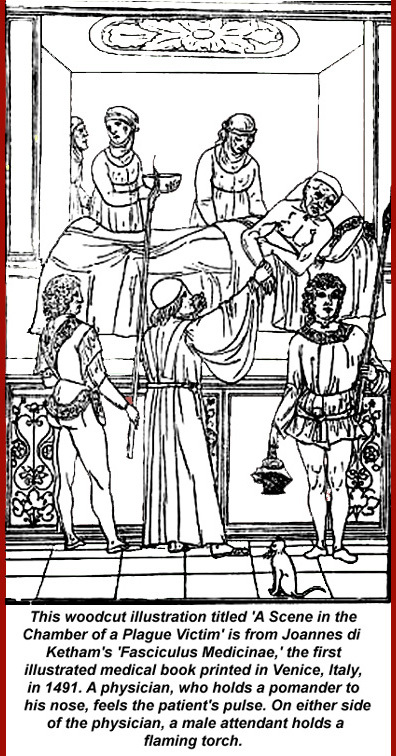 Of the four versions of yersina pestis plague, enteric killed fastest (a few hours after ingestion -- 100 percent fatal), followed by pneumonic (shortly after inhalation -- 100 percent), bubonic (several days -- 30 to 50 percent), and septicemic (a few hours after the bubonic infection entered the blood stream). If you survived (having had the bubonic version of plague) you might have enough antibodies to survive the next outbreak (but you could still be a bacteria reservoir. A second plague outbreak (years after the first) might then be called a "children's plague", because it infected mostly antibodyless persons born after the first iteration. Epidemics are simply mass infections. Equilibrium collapses, and many die. Pandemics are multiple epidemics, either across wide area or over long periods, and usually both. How it spread Yersina Pestis is common in wild rodent populations and seldom spreads beyond wild populations — its endemic, for example, among prairie dogs in the American West and in wild rodent populations in Asia and Africa. Some rodents die, but the population in general becomes a reservoir which can be breached either by humans encroaching on their habitat or because the food supply in the habitat is disrupted. The 14th century Eurasian outbreak was contemporaneous with the end of the Medieval Warm Period and the start of the volcanism driven the "Little Ice Age", which is thought to have put the Central Asian wild rat population in motion toward areas of human population to the southeast, i.e., toward the Crimean . Another theory links spread of the plague to the Mongol unification of Asia which facilitated trade in Asia and inadvertent transportation of infected rats by traders and or by persons who had survived the bubonic type of plague but were still contagious. If they went toward the Crimea, that may have been how the plague got there and then onward to Europe. In 1347 the plague spread into Europe (from the Crimean Area) and Egypt (from Syria/Mesopotamia). By 1350 plague had crossed North Africa and all of Europe to the Atlantic Ocean and looped back into north eastern Europe (Russia and other north Slavic areas) — the farthest extent appears to have been Greenland where the population was totally wiped out. -1350 - Wipes out Greenland? Not every effect is due to the plague. Some trends happening earlier. Real danger of "post hoc ergo propter hoc" fallacy. Overall "guestimate" one third of the European population died in the first wave of plague 1347-50. Population went down from 70-75 million to about 50 million. -England -- 40-50% (e.g. clerical mortality - 40-50%). "Childrens plague", 1361-- 25% of population dies. Population declines for 150 years as a result of local recurrences. Price of Labor rises - peasant revolts when control attempted. Golden age for the laborer? -Increased prominence of cities over the countryside.